Luke Jones and Jones Performance Horses is located in the rolling hills of southern Iowa in Allerton. Owner Luke Jones trains and shows working cow horse, reining, heading, heeling and calf roping horses. He competes nationally in American Quarter Horse Association, American Paint Horse Association, National Reined Cow Horse Association & National Reining Horse Association. Luke and his wife Erin have a thriving business of winning and hope that you'll take some time to learn about them. Luke Jones grew up in the small farm town of Allerton, IA. He’s always been a country boy, but he got really interested in horses around the age of 12. He had always helped his dad, Jim, with the farm’s cow/calf operation so it just seemed natural that Luke would continue in that kind of work. Throughout high school Luke was a member of the Iowa State High School Rodeo Assn. He competed in cutting, calf roping and team roping. This enabled him to go to nationals all four years. From all of his success, people would gather that he had the best horses and a great trainer. The secret? Luke trained and broke all of his own horses. Then in his junior year, he began training horses for other people. Luke went onto to North Eastern Oklahoma Community College in Miami, OK, for a year on a rodeo scholarship. He then transferred to Missouri Valley College in Marshall, MO, to continue his education and rodeo. It was there he met Erin. After graduating in 2001, he moved back to Allerton and started training full time. Luke and Erin built the barn, Trails End Arena, in the winter of 2001. 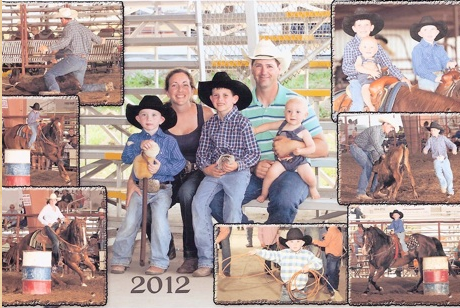 Luke has trained numerous AQHA World Qualifiers in working cowhorse, reining, heading, heeling and calf roping. In 2007 he won the APHA World Championship in Jr. calf roping. He won the NCRCHA Open Futurity in 2008. Luke qualified for the Open finals at the Snaffle Bit Futurity in 2010. He was the SRCHA Intermediate Open Futurity Champion, SDRCHA Open Futurity champion and NCRCHA Open Futurity and Derby in 2011. He won the Intermediate AQHA World Championship in Jr Cow Horse, 6th and 11 in Jr Working Cow Horse, 9th in Sr Heading, and a finalist in Jr. Calf Roping. Erin grew up on a farm in southwest Missouri, in Mt. Vernon. She’s always gotten great joy out of riding and was blessed enough to have horses in her life. She was involved in AYRA and MJRC throughout middle school and then competed in the Missouri State High School Rodeo Assn. where she was a barrel racer. She was the Missouri state barrel racing champion her sophomore and junior year, and then placed third her senior year, after her horse was hurt. She competed at nationals all of those years and went onto Missouri Valley on a rodeo scholarship.